Annotation: At the imitative stage, form is the primary focus. Beginning-level ELLs (young to old) need basic training in and assessment if imitative writing. Imitative writing includes the rudiments of forming letters, words, and simple sentences. Tasks in hand such as writing letters, words, and punctuation are within the larger domain of language assessment. One hand writing assessment or activity is have the student copy letters or words. The assessment I have included is one that can be used in any early English development stage. In this assessment students trace capital letters several times. The administrator/ teacher can then ask the student to write the letter they just traces on a blank piece of paper. The original assessment sheet (with traceable letters) is available for download below the sample. Directions: Trace the capital letters. Write slowly and neatly. Annotation: Another type of assessment for imitative tasks is spelling and detecting phoneme-grapheme correspondences. There are a number of tasks that are in use to assess the ability spell words correctly. Spelling tests is the traditional means of assessing vocabulary. Scoring emphasizes correct spelling and students must listen carefully to words being called. The example assessment is essential ESL vocabulary that all ELLs are prepared to know and understand. In these exercises, you need to take the information in the first sentence and re-write it, using the word in bold so that the second sentence has exactly the same meaning. You cannot change the word in bold in ANY way. You can use only a maximum of FIVE words for each space. Only use contractions for negatives: e.g. don't / hadn't / wouldn't, etc. 1. Give me a call only if you have to buy gas for the car. Unless____________ gas, don't call me. 2. Watch the new secretary carefully this week to make sure she doesn't make any big mistakes. Keep _____________ secretary this week to make sure she doesn't make any big mistakes. 3. You shouldn't be surprised at Kevin winning that tournament. It____________ that Kevin won that tournament. Annotation: Ordering tasks at sentence level appeals to students who favor word games and puzzles. The student orders (or reorders) a scrambles set of words into an accurate sentence. The sample I included was withdraen from the book of Brown & Abeywikrama. It is a Reordering words in a sentence task. 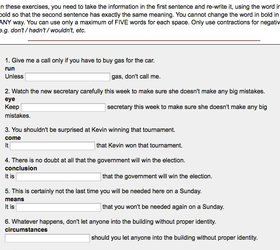 This task generates writing performance and taps into grammatical word-ordering rules. Students have to apply logical reasoning and background knowledge to order sentences. Douglas-Brown, H., & Abeywikrama, P. (2011). Language assessment, principles and classroom practices. (2nd ed.). White Plains, NY: Pearson Education. 2. What are you studying? Annotation: Responsive and extensive writing both range from lower-end tasks to more open-ended tasks such as writing short reports, essays, summaries, and responses. A lower-order task is guided question and answer. The teacher/ test administrator presents a series of questions that serves as an outline of the written text. The teacher provides questions that will serve as a guide. I included examples questions from the book of Brown & Abeywikrama. Guided writing texts of students may be as long as two to three paragraphs. Writing prompts like the one I included are similar to the ones that appear on formal tests. This method can also be used as a prompt for the test-taker to create an outline. (p. 280) Douglas-Brown, H., & Abeywikrama, P. (2011). Language assessment, principles and classroom practices. (2nd ed.). White Plains, NY: Pearson Education. 1. Some people say that the best preparation for life is learning to work with others and be cooperative Others take the opposite view and say that learning to be competitive is the best preparation. Discuss these positions, using concrete examples of both. Tell which one you agree with and explaining why. 1. When choosing a place to live, what do you consider most important: location, size, style, number of rooms, types of rooms, or other features? Use reasons and specific examples to support your answer. Annotation: Extensive writing includes successful management of all the processes and strategies of writing for all purposes. Extensive writers focus on achieving a purpose, organizing and developing ideas logically, using relevant supporting details, and demonstrating syntactic and lexical variety. Assessments that can be utilized to exemplify such tasks can be a lab report, library research paper, narration, and many more. These assessments are known as strategic options that either attend to task or to genres of writing. Extensive writing is essential an extended version of responsive writing. Library research papers are common and effective tools in assessing writing strategies. The teacher should establish and share these guidelines with the student. Paper guidelines are…state purpose or goal of research, include appropriate citations, accurately represent others findings, writers own interpretation, suggestions for further research, and conclusion. I included an example course requirement of a research paper from actual class. The teacher goes into detail what they paper should included and how it should be formatted. Below I supplied possible topics that ESL students would be able to write. Your research paper should consist of approximately 1500 words. The basis of good research paper is clear structure, coherent and consistent analysis of the problem, good examples/illustrations, without mistakes in spelling, grammar, style and syntax. Annotation: Another strategic option that is commonly used as an ESL assessment is responses to readings/ lectures/ videos. Students will response will reflect the message (meaning) of the original have accurate supporting details, express writer’s opinions, conform to the expected length of paper and have a stance that either defends or supports the opinion effectively. A literature response journal is a great and personal assessment tool. This assessment is not practical in grading and time for the teacher but it does allow the students to develop meaningful texts. Students build communication skills and improve reading comprehension, as they are scaffold through literature response journaling. “A literature response journal can be a powerful tool for communicating thoughts and ideas about books, poems, plays, and non-fiction texts. Journaling allows students to experiment with a variety of writing skills and genres” (Williams). Teachers give appropriate topics that agree with proficiency level and establish guidelines for what the response to literature should entail. I included a sample of reader response journal prompts and a possible format for journal entries. This is not an ESL resource but can be adapted for personal proficiency levels and include appropriate prompts that address the student/teacher needs. The original is available for download below the sample. Williams, Margaret M. "ESL Strategies for Literature Response Journals." Langauge Study. N.p., 30 2009. Web. Web. 10 Dec. 2012. <http://suite101.com/article/esl-strategies-for-literature-response-journals-a128665>. 2. Are the characters realistic (do they seem like they could be read people)? Why or why not? 3. Create a timeline of events from what you have read so far. 4. Create a ‘WANTED’ poster for the antagonist (principal character that is "bad guy" or in opposition). 5. Describe a character that you would like to meet (which doesn’t mean that you think you would like the character, but that you think the character would be interesting). List 4 questions that you would ask. 6. Describe something you have read that is similar to this. 7. Describe the major conflict. What side are you on? Why? 8. Importance of an Episode: Select what you consider the most important episode in the book/film. Explain (briefly) what happens, why you think it is important to the section, your reaction to the episode, and why you react this way. 9. Setting: What effect does the setting (time, place, social and historical background) have on the character’s thoughts, actions, and choices? What would be your reaction to having to adapt to the character’s environment? Why? 10. Describe the setting’s time and place. Create a new setting that you think would be better for the story and describe it. 11. Describe what was either believable or unbelievable about your reading. Defend your opinion. 12. Describe the similarities and differences between the main character and you. 13. Theme: Explain an idea or theme –either stated outright or implied by events—which is meaningful to you. Explain its importance to the book/film and why you find it meaningful. 14. Character Comparison #1: Compare yourself to a main character. Point out your similarities and try to account for differences between you and him/her. Considering what you have discovered, what is your reaction to this character? Why? How do you think the character would feel about you? 15. Character Comparison #2: Compare a character from your book/film to a character from another work of fiction (novel, play, film, short story). What are their similarities? What are their differences? Which character do you admire more? Why? 16. Judgment: Examine a character’s actions, values, behavior, etc. with which you disagree. What is happening? Why is the character thinking/acting this way? What do you see wrong with it? Why? What would you suggest as a preferable response/behavior/value?